Ritips Evolution are precision-made universal dispenser syringes for use in routine and research laboratories. 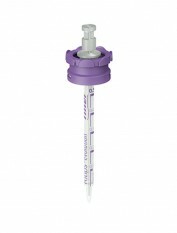 They have smooth action plungers and have Violet printed graduations for easy visual volume verification (excluding 0.1ml and 0.2ml syringes). Ritips are offered in nine syringe capacities and are the most universal fitting repeat dispenser syringes on the market. A selector chart comes printed on each carton to help you decide which syringe volume is best for your dosing requirement. (NB When used with Multipette M4 the volume display is inoperative).